Rock gardens are once again in style, because they really fit today's lifestyle with limited time for gardening. They're perfect focal point areas because the rocks themselves are so beautiful and look good year round. Rocks and water are a natural pairing, so a rock garden surrounding a small pond or waterfall can be a great investment. You can choose local rocks, big specimen rocks, imported rocks of a special color to suit your surroundings – checking around with local quarries or building supply dealers will reveal a wide array of choices. 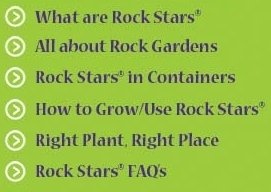 You can even grow Rock Stars® without using any rocks at all. The classic use for Rock Stars® is in a traditional rock garden. Depending on how ambitious you are, this might be on a large scale with carefully placed boulders, or it might just be a small accent grouping of stones, maybe at the edge of the patio or beside a water feature. Rock Stars® can be used in other places too, including containers such as alpine troughs, gravel or scree gardens, growing in dry stone walls or just as tuck-in plants to accent a walkway or patio. Really, they can be used nearly anywhere you want to grow something small and cute! 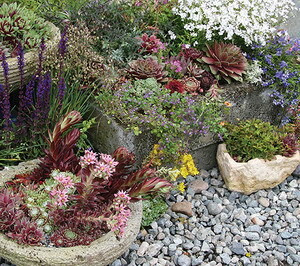 There are as many different kinds of rock gardens are there are rock gardeners. While rock gardens can be broken down into a number of distinctive styles and types, don't feel boxed in by these when you create your own statement. Your garden, your rocks and your choice of plants are completely unique to you, so give some thought as to what might best fit your surroundings, your dream and your lifestyle. Although the use of rocks as decorative and symbolic elements in gardens can be traced back to very early Chinese and Japanese gardens, rock gardens dedicated to growing alpine plants have a shorter history. During the age of the great plant explorers (basically the 1800s) there was great interest in the exotic discoveries being brought back to England, and people wanted to successfully grow these amazing new treasures. Although others had previously written about growing alpine plants, it was Reginald Farrer that, with the 1919 publication of his two-volume book The English Rock Garden, literally rocked the gardening world for the first time. There was much interest in Farrer's method and approach to creating large-scale, naturalistic settings for growing alpine plants. But even in the early 1900s, in the days of cheap labour, gardening on this kind of scale was limited to the wealthy and to institutions such as botanical gardens. It's hard to imagine the physical effort that went into constructing a huge rock garden without the aid of modern equipment. A good many of the large rock gardens created during this period survive to this day. For a much more complete history of rock gardening, see the North American Rock Garden Society website. Although Farrer's approach to rock gardening was revolutionary at the time (and it's well worth reading), today it can seem overly complicated, expensive and time-consuming. Gardeners have created lots of simpler yet successful methods for growing alpine plants in ways that vary from the naturalistic to the extreme avant-garde. Here are a few of the many styles we see today, and some basics on how to go about creating them.